Dianova participates in International Projects on Public Health. These international projects are developed in collaboration with Partners from Europe. The focus is, specifically, on Capacity Building, Training and Communication aimed at multiple Stakeholders. The SMAPP Project – Tackling Social Media Use with Positive Approach . Important to realize, is financed by the Erasmus+ Program – Cooperation for Innovation and Good Practice Exchange program. “Working the problematic use of Social Networks with a positive approach”. In the first place, joins four Organizations from Turkey (the Coordinator), Italy, Portugal and Spain. As Education / Adult Education (teachers, trainers, managers and training professionals). Equally, Public Health (General Physicians, social professionals, psychologists, addiction specialists, sociologists). Also, Information and Communication Technologies for the exchange of good practices, knowledge and experiences. As an illustration, they identify, share and compare methodologies, techniques and tools used in the different countries. Markedly, in the Education / Adult Education and Health Education. For this reason, they will develop a positive approach in the field of problematic use of Social Networks. Including, conducting a pilot study in this field. > First, Research on the patterns of use of Social Networks. For examplo, online frequency, devices used to connect to the Internet, aims of the use of Social Networks, among others. The data analysis will be carried out in depth by the Project Partners. And the results will be communicated through their digital platforms. to begin with, development of new skills in the context of a positive approach to excessive use of social networks. overall, positive approach to addiction studies. in short, interdisciplinary perception “adult education – communication in public health – use of social networks”. Or others that prove useful to increase the responsiveness of the organizations involved in this theme. Meanwhile, during the training actions, the Teams will visit other Organizations with experience within the scope of the project. WS1 – Analysis of the results of research on patterns of use of social networks. WS2 – Creation of guidelines for the use of the internet and dependence on social networks. Each specialist in the different areas of knowledge will contribute to this regard. WS3 – Monitoring and analysis of social network information. First, Contest “Using social networks against internet addiction on social networks”. To point out, viral videos that social networking users create about their problematic use or internet addiction. With this in mind, they will be launched on social networks themselves to create awareness. Second, Contest aimed at university students of communication sciences, arts or related disciplines. They will draw up guidelines on the excessive use of social networks. In particular, that can later become viral films by other institutions for use in their social networks. The last meeting of the project will feature the award ceremony event. In fact, this will be a multiplier event attended by decision-makers, representatives of relevant organizations. Especially, in the areas of education and public health and local / national media in Turkey. Dianova Portugal was invited to join the consortium led by the Directorate General of Health of Turkey. In particular, this is due to its expertise in the area of addiction and health cause communication campaigns. For example, the #dontletthempossessyou awareness campaign on internet addiction 2016. Besides, Dianova pioneers in the area of addiction without substances, such as Internet, Social Networks, Online Games or Gaming. The consortium also includes Kairós Sociedad Cooperativa de Iniciativa Social (Spain) and Cassandra Solutions Società Cooperativa (Italy). Finally, the project began on 10/01/2017 and will last for 24 months. Dianova Portugal was one of the 5 partners of the project “Cooperation and Innovation for Good Practices. The Communication Strategy on Drug Addiction “2015-2016. It was financed by the ERASMUS + Program | KA2. Dianova Portugal was one of the partners with the Turkish Green Crescent Society (Turkey, Project Coordinator). Including, Istanbul Halk Sagligi Mudurlugu (Directorate General for Health, Turkey), EURAD (Netherlands) and Nationaline Tabako Ir Alkoholio Kontroles Koalicija (Lithuania). The project goal: design an integrated communication strategy that allows a scientific vision for the improvement of Media instruments. The aim is to raise awareness among adults about addictions. First, international training meetings on communication in public health in the 4 countries. Between May and October 2015. Second, the development of a communication strategy in health. Third, a university competition in the four countries (2016). Including, an award ceremony for the national and international winners with videos on this adult-oriented awareness campaign (June 2016). The International Video Contest “Let’s talk about this, You’re not alone!“. Students of Professional Schools and Universities in the areas of Multimedia Communication and Journalism, between 15 and 25 years. The Gala Awards and Gala Dinner Ceremony, 10th June in Istanbul. 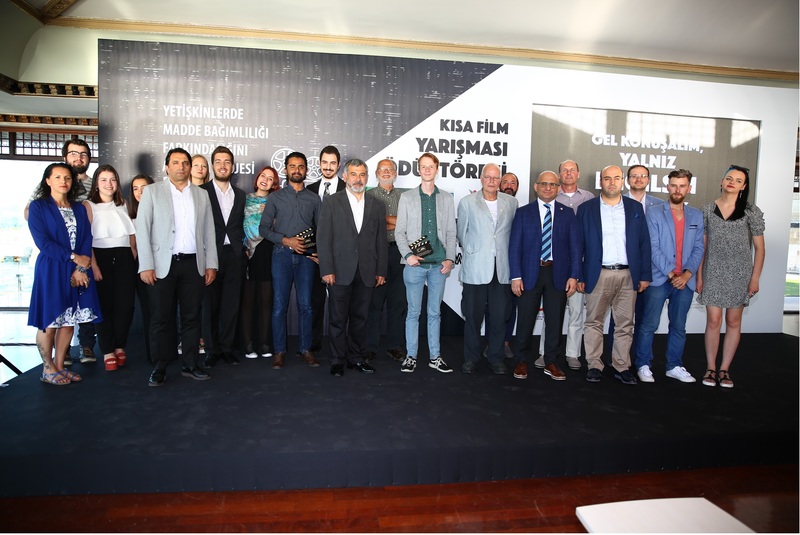 The 12 Finalists from the 4 countries, and 3 Winners Awards: Turkey in 1st place, 2nd Holland and 3rd Lithuania. See the 1st national Winner video from Portugal. UNODC 60th CND Session, March 13-17, Vienna, Austria. Dianova Portugal was one of the Speakers on March 16th at the “DAWA: A FIVE-STEP APPROACH TO PREVENTION” Side Event. Click for the Dianova Presentation. “DAWA 2015-2016 transnational project from the Portuguese perspective. Health Communication Learning Lessons and Achievements from the Portuguese Perspective”.